The Made Up Maiden: Australia Day 2013 nails! Happy (belated) Australia Day! As my regular readers know, I'm still out of the country recuperating from surgery, but I did want to do something to commemorate the occasion, so I decided to do a simple manicure in green and gold to celebrate. Unfortunately, I didn't have many polishes or any of my nail tools with me, so I was forced to wing it with what I did have on hand. 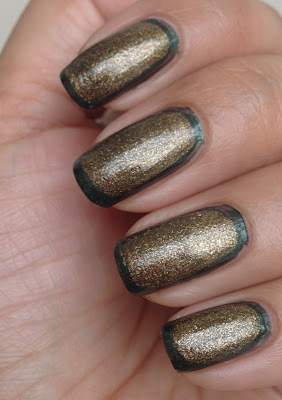 Fortunately, I found an antique gold polish from Missha in shade HKH01 and a small bottle of some random forest green polish in my stash, so I decided to try my hand at my first 'framed' manicure. The framed manicure consists of painting your nails as per norm, followed by layering a contrasting shade on top, leaving a thin border of the first colour to frame the second colour. 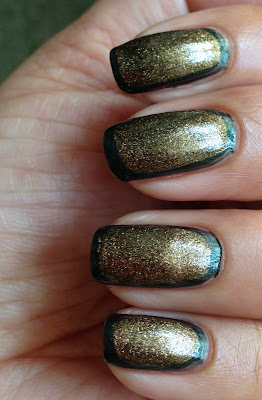 I'm not completely satisfied with this manicure as it's not as neat as I'd have liked, but I did have some trouble with the polishes due to the brushes/formulas, so all things considered, perhaps it wasn't too bad an effort. There you have it, lovelies, my first attempt at the framed manicure! I'd definitely like to attempt this again, but I'd probably leave a thicker border around the second shade and use more contrasting colours for added emphasis! How did you celebrate the long weekend, lovelies? Get up to anything exciting? If you did a special post to commemorate Australia Day please leave me a link so I can come by and check it out! Thank you so much, Vita! It's a very pretty shade, seems to change colour in different lighting conditions! Oh dear, I wasn't aware you were out of the country recuperating from surgery! I had some personal dramas myself so haven't been in the loop with lots of things! I hope you are well on your way to full recovery now xoxo As always, your manicures look so awesome!!! That's all right, it happens! Thank you, Mandy! I hope things are looking much better with you! Hope you are doing well now .. wishing you a speedy recovery ! Thank you, Saumya! I loved your post! 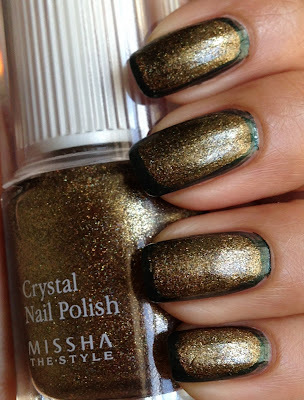 A lovey take on the classic green and gold. Looks lovely! Thank you, Cathy! Your comments always mean so much to me! Hope you're ok! Happy Australia Day!!! I'm doing much better, thank you, Abigail! 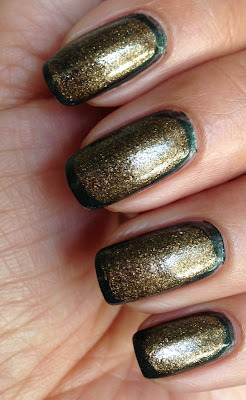 Even with your lack of polishes, you are still way more creative than I am! Haha, thanks, Hui! Hope you've been enjoying your holiday away! OMG!!! 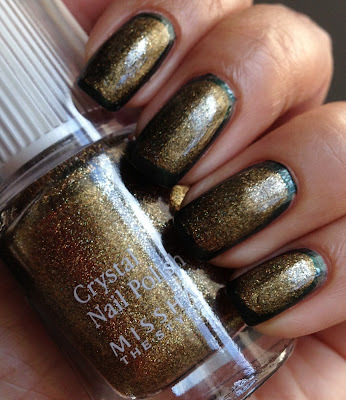 This mani is so pretty. Love the color combos for it looks so elegant and classy. Perfect for any occasion or for evening parties. Love it! Thank you so much, Rossy! It looks amazing Nalini! So good. I haven't tried a framed mani before but you absolutely nailed it! Thank you, Ingy! 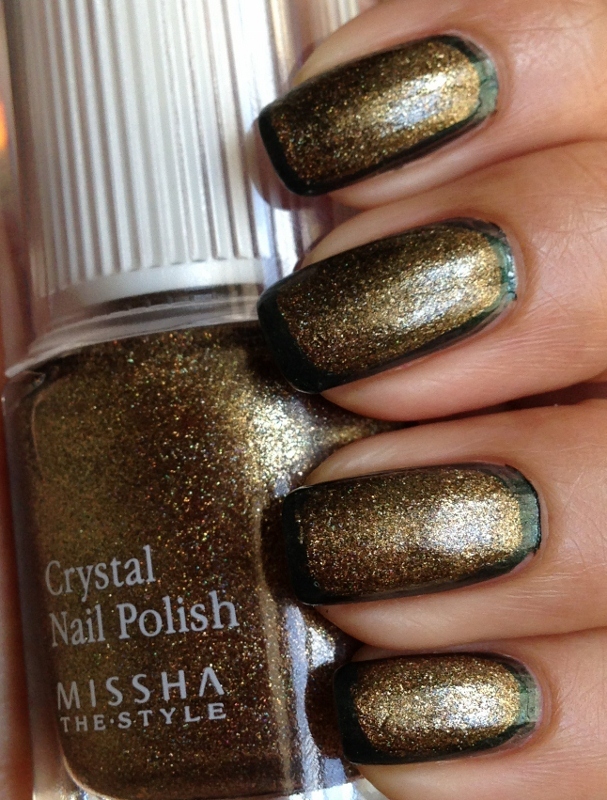 You must try it, it's really simple but so pretty!